When the leading manufacturers of solid surface design a trade show display to showcase their product they call on ASST to fabricate. At ASST we are GOING BEYOND. 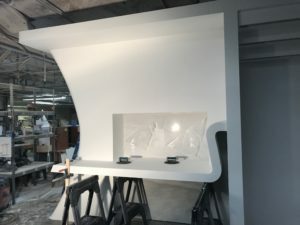 Did you ever wonder how fabricators get large solid surface seams together quickly and aligned perfect? Most solid surface fabricators use a Parallign Seam Clamp. The vacuum pods pull down with approximately 275 lbs of pressure per pod and a spring loaded cam pulls the seam together. Translucent materials are continuing to be highly popular with design professionals. Technological advances in LED lighting and CNC machining have been instrumental in this trend. Intricate patterns filled with liquid resin materials have many applications for both signage and artwork. 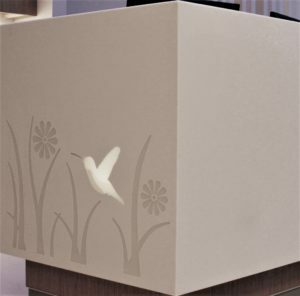 Design professionals are frequently unaware of how to specify resin inlay work. 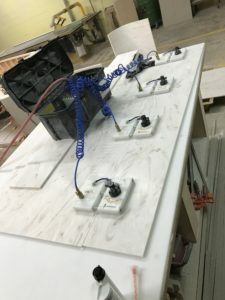 As an innovative technique, fabricating resin inlays can be challenging to achieve satisfactory results. Project specifications many times do not adequately identify fabricators who have experience in this specialty area. Without credible experience, resin inlay projects can have disastrous results. Bubbling and cracking of resin are all potential outcomes for those without experience in this highly specialized area. ASST’s team of technical experts are able to assist you with these complicated fabrications. With our experience, we have found that utilizing UV resistant resins that are self-leveling and non-yellowing are crucial to achieving a quality end result. We have experimented with many different products and can assist you with a solution that exceeds your expectations! ASST is uniquely positioned to fulfill all aspects of your project. Whatever you need, ASST can build it to the exact specifications, in a safe manner and to the finest quality standards you expect. We look forward to Going Beyond to address your exciting project challenges. Contact us now online or call us at 717-630-1251. Sustainable and responsibly resourced materials are a requirement for most projects today. With LEED points a frequent requisite, the core materials specified need to be green. Design professionals have to comply with a variety of environmental requirements. 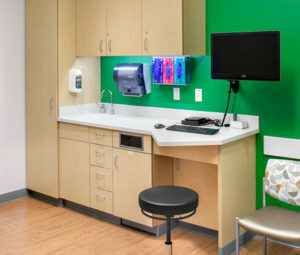 Carbon emissions, regionally sourced materials and recycled content are all of foremost concern when specifying casework. With a plethora of regulatory certifications required for wood products, it can be difficult to discern what information is most relevant. Some casework manufacturers are intentionally vague on the origins of their core materials to disguise their source. Design professionals today rarely have the time to investigate and confirm these materials with the certifications needed for a project. In response to provide our customers with great service, ASST has developed a dealership alliance with TMI Systems to help with overcoming these challenges. TMI has been in business since 1969 and their trusted commitment to sustainable design is unmatched in the casework industry. Core material options are available with 20% recycled content as well as low emitting adhesives and composite woods. These are only a few of the benefits to this new dealership alliance. Combined with ASST’s industry leadership with solid surface fabrication, design professionals now have a comprehensive resource to obtain a CSI DIV 6 &12 specification solution. Whether it is for healthcare, education, corporate or retail our team can ASsiST you with your sustainable project goals. Who says it’s not easy being green?